In a large bowl, combine the first four ingredients; set aside. In a saucepan, bring corn syrup and sugar to a boil, stirring frequently. Remove from the heat; stir in peanut butter and vanilla. 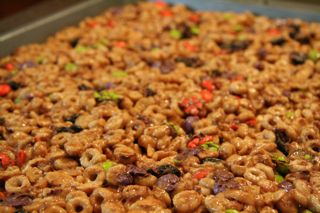 Pour over cereal mixture and toss to coat evenly. Spread into a greased 15-in. x 10-in. x 1-in. baking pan. Cool. Cut into 3-in. x 3-in. bars.